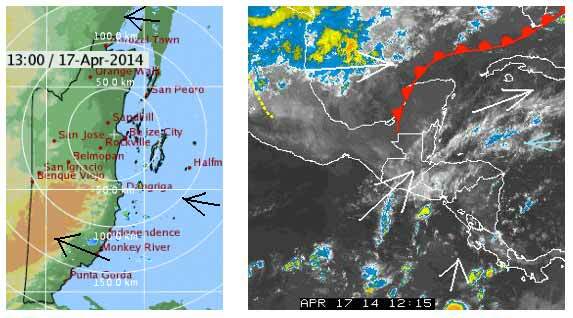 Belize NMS: Relatively moist and unstable conditions exist. 24-hour forecast: Cloudy spells with a few showers and possible isolated thunderstorms mainly over the north and along northern coastal areas. Today: Winds: East 5-15 kt. ; seas: Choppy. ; waves: 2-4 ft.; a few showers and possible isolated thunderstorms. Tomorrow: Winds: East 10-20kt. ; seas: Choppy. ; waves: 2-4 ft.; a few showers. Marine Outlook: Friday night:- Winds: E/NE 5-15 kt. ; seas: Choppy. ; waves: 2-4 ft.; a few showers. General Outlook: Cloudy spells with a few showers and possible isolated thunderstorms mostly over northern coastal areas and inland areas on Friday afternoon. I'm getting a 'Program Error'this morning something isn't quite right. Just a few scattered showers, crossed the coast line in Toledo and a little up in Mexico, but now disappearing. Cold front retreated back over the Gulf of Mexico. . ... SW air has pushed it back and bringing high level cloud over Belize. Doesn't look as if we are going to get rain today, lets hope some change by this evening, but I am not yet seeing that.